"Dropped in and needed to have a quick CD and video copied. 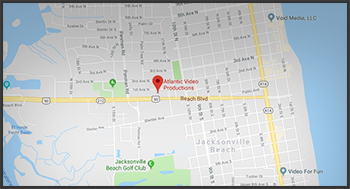 Mitch banged it out in less than five minutes.... love their service, love their prices,... best in town"
A native of Atlantic Beach, Mitch Kaufmann has been offering video services to area businesses and residents since 1984. He started Atlantic Video Productions by shooting weddings, business seminars, and sporting events. Mitch has witnessed first-hand the technological evolution of the video production industry, having spent the past 25 years travelling around the world shooting and editing TV Shows, corporate productions, weddings, stage performances, and much more. In 1992, Mitch moved his studio to its current location on Beach Blvd. in Jax Beach, where he's been satisfying corporate and personal clients for over 25 years. No matter what level of production you need, from a Life Celebration Photo Montage to a broadcast ready 30 minute infomercial, or just a VHS Tape to DVD Duplication, we treat every person, every business, every client, with the same professional courtesy, with a fast and affordable turn around. Putting the Power of Video to Work for You. Serving Northeast Florida for more than 25 years. © Atlantic video productions 2018. all rights reserved.